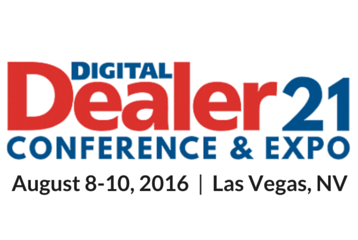 Outsell announced today that it has been invited to present and participate on a panel along with PCG Companies and Sunshine Chevrolet at Digital Dealer 21 taking place August 8-10, 2016 in Las Vegas at the MGM Grand Las Vegas Hotel & Casino. Brian Pasch, Principal of PCG Companies, Kristy Elliott, Executive Director of Sunshine Chevrolet (part of the SunStar Network), and Outsell’s Valerie Vallancourt, Director of Marketing will present a panel discussion on the “Top Five Ways Automotive Dealers Can Transform Their Marketing in a Digital World and Increase Customer Engagement.” This panel will take place Monday, August 8 from 8:00am – 8:50am. This panel of experts will discuss the top five ways automotive dealers can transform their marketing and increase customer engagement – and the tools as well as strategies that can be used to engage consumers where they are in the buyer’s journey. The next presentation will feature a discussion led by Outsell’s Valerie Vallancourt and Sunshine Chevrolet’s Kristy Elliott on the topic “The 5 Stages of Customer Engagement and What Auto Dealers Can Do To Optimize Each One” on Tuesday, August 9 from 9:30am – 10:20am. This session will explain the 5 stages of customer engagement – Discover, Shop, Buy, Own and Advocate and the tools that can be used at each stage, such as email, mobile, direct marketing, and social. The key to the success of the lifecycle is to ensure the tactics are analytically driven. Also, they will review simple customer engagement tools and strategies that can transform how dealers communicate with customers and prospects throughout the customer lifecycle. Outsell is also a sponsor at Digital Dealer 21 and will showcase its customer engagement platform, Outsell Fuel™ and its numerous functionalities, such as Outsell BuyerScout at booth #320. Outsell Fuel, is a multi-channel customer engagement platform that enables automotive dealers to engage with customers wherever they are in their lifecycle, track behaviors to identify in-market buyers, and understand shopper intensity. Outsell Fuel manages millions of consumer interactions every month for dealers nationwide representing all major automotive brands.